So it turns out Insidious does do a few things that help it to stand out from the pack. First, it's not a standard haunted house movie, possession, or poltergeist film. It deals with astral projection. Josh and Renai Lambert (Wilson and Byrne) have just moved into a new home with their two young sons and infant daughter. Very mild and bizarre occurrences largely go unnoticed until their son, Dalton (Ty Simpkins from Iron Man 3), goes up into the attic and confronts some evil and unknown presence. He falls and bumps his head, leading his worried parents to put him to bed. The next morning they find him in a medically unexplainable coma. Soon, Renai begins seeing and hearing strange things around the house. Things get so bad for the Lamberts that they move to another house, only to learn that the strange happenings are not "hauntings" but the presence of otherworldly entities trying to gain entry into Dalton's body, who it turns out is a gifted astral projectionist who has gotten lost in a shadowy realm called "The Further". I can't really say that I remember any horror movie using the concept of astral projection in such a way, so it certainly felt fairly unique. "2 points for Insidious," I shout, in my best Dumbledore voice. Secondly, the movie completely eschews the "less is more" rule for haunted house movies (granted, I did just say this wasn't a haunted house movie) by actually showing us the entities haunting the family. While this might have contributed to me feeling not as creeped out by the movie as some of the designs are more fantastical rather than horrific, it certainly does help the movie to stand out amongst other similar films that never show anything. The designs of the "entities" are quite interesting and well thought out. Subtle things such as having an older man play an old woman or having a very small man play a boy definitely give the entities an odd feel, as something in your mind tells you that something isn't right about them, but you can't put your finger on it. The main entity, while memorable, definitely kept reminding me of a cross between Darth Maul and Buffalo Bill from The Silence of the Lambs. 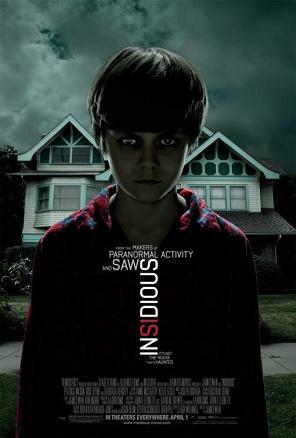 Insidious did not blow my mind or linger there like The Conjuring did, but it's certainly a well made and enjoyable film. It's solidly directed, features a nice mix of atmospheric, visual, and "jump" scares, offers an engaging story with a few humorous elements to break things up, and includes characters and situations that most viewers will be able to relate to and empathize with in some way. James Wan certainly has a talent for horror films, and I'm definitely anticipating Insidious: Chapter 2 which opens September 13th, 2013. I actually think I'm glad there's a sequel, as the way this movie ended didn't satisfy me. It's a shock ending, which the majority of the time I hate, but since we're going to get to see how things continue, I'll probably stick around for a bit, but I'll be looking over my shoulder. Just in case.